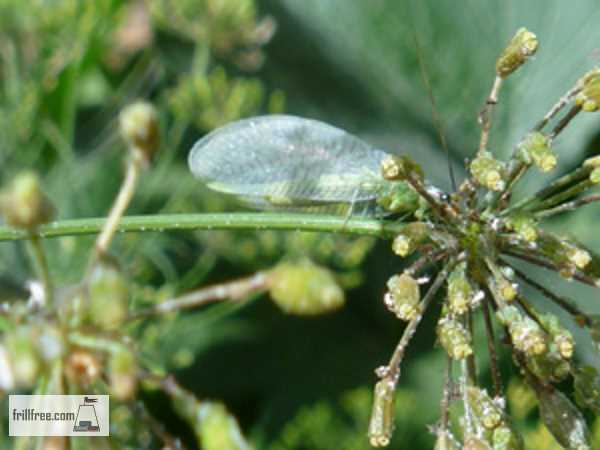 Green Lacewings are a common sight in an organic garden, especially if you're surrounded by woodlands. I've seen these fragile looking insects hatch out of pieces of firewood brought in to dry out - this is the only time I've ever thought of them as pests. Generally, they'll fumble their way towards the light, and get stuck on your windows. In the garden however, they're predators with an impressive appetite. You will know you have aphids on any of your plants long before you can even see them; the lacewings will find them first. The adults are the ones that do the work, unlike lady bugs which it's the larvae. Their favorite meal are aphids, which are so nice and juicy from eating your plants. Even though these insects appear frail they will patrol your garden tirelessly to rid it of pests.